February is for love and football. Or love OF football. Or the love of shopping. Or the love of a good Mardi Gras party…. Any way you spin it, Big Bottom’s gotcha covered! 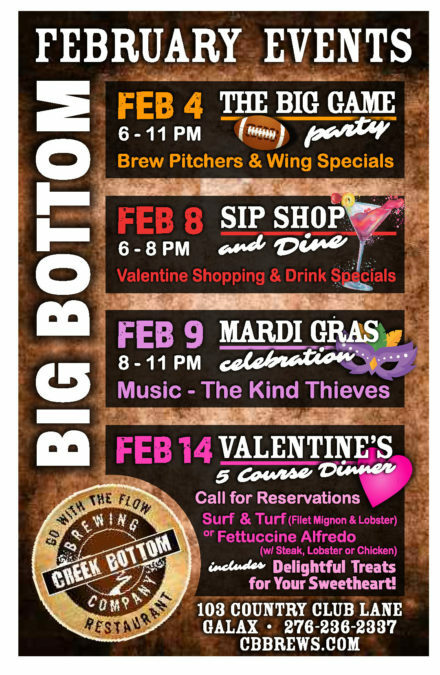 From our “Big Game” party to our 5 Course Valentine’s Day Dinner, we have everything to make anyone happy this February! Sip, Shop, and Dine is back, AND we’re bringing THE KIND THIEVES in for a special Mardi Gras show!!!!! Do NOT miss out!